Promo period starts June 1, 2010 to October 30, 2010. To join the promo, consumers should purchase any of the following product variations bundled with a product coupon: 4 tablets of Neozep Forte or 1 Solmux Capsule or 1 Solmux Chewtab. The promo bundle can be purchased at major drugstores nationwide. Consumers must peel the promo coupon to find out their instant prize. Prizes are printed inside the promo coupon. Free 10 Smart Buddy SMS for every P 15.00 worth of purchase of Smart Load Load P 15 at any Smart retailer. After loading, send UNILAB to 2861. Example: UNILAB 8398230AB to 2861. You will receive your 10 free on-net SMS within 48 hours. Winners should present their promo coupon upon claiming the prize to the partner merchant representative subject for verification. 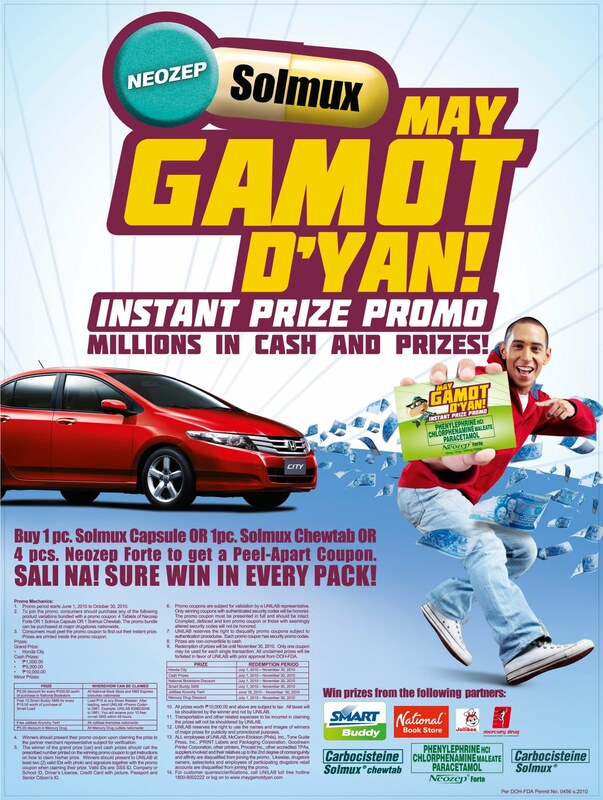 The winner of the grand prize (car) and cash prizes should call the prescribed number printed on the winning promo coupon to get instructions on how to claim his/her prize. Winners should present to UNILAB at least two (2) valid ID’s with photo and signature together with the promo coupon when claiming their prize. Valid ID’s are: SSS ID, Company or School ID, Driver’s License, Credit Card with picture, Passport and Senior Citizen’s ID. Promo coupons are subject for validation by a UNILAB representative. Only winning coupons with authenticated security codes will be honored. The promo coupon must be presented in full and should be intact. Crumpled, defaced and torn promo coupon or those with seemingly altered security codes will not be honored. UNILAB reserves the right to disqualify promo coupons subject to authentication procedures. Each promo coupon has security promo codes. Promos are non-convertible to cash. Redemption of prizes will be until November 30, 2010. Only one coupon may be used for each single transaction. All unclaimed prizes will be forfeited in favor of UNILAB with prior approval from DOH-FDA. 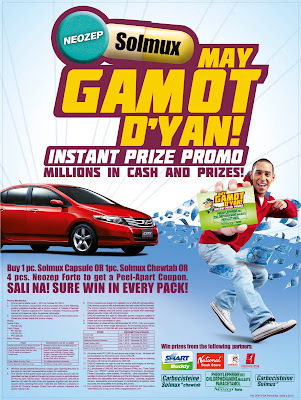 All prizes worth P 10,000.00 and above are subject to tax. All taxes will be shouldered by the winner and not by UNILAB. Transportation and other related expenses to be incurred in claiming the prizes will not be shouldered by UNILAB. UNILAB reserves the right to use the names and images of winners of major prizes for publicity and promotional purposes. All employees of UNILAB, McCann-Erickson (Phils.) Inc., Tone Guide Press, Inc., iPRINT Labels and Packaging Corporation, Goodream Printer Corporation, other printers, Procast Inc., other accredited TPAs, suppliers involved and their relatives up to the 2nd degree of consanguinity and affinity are disqualified from joining the promo. Likewise, drugstore owners, salesclerks and employees of participating drugstore retail accounts are disqualified from joining the promo.